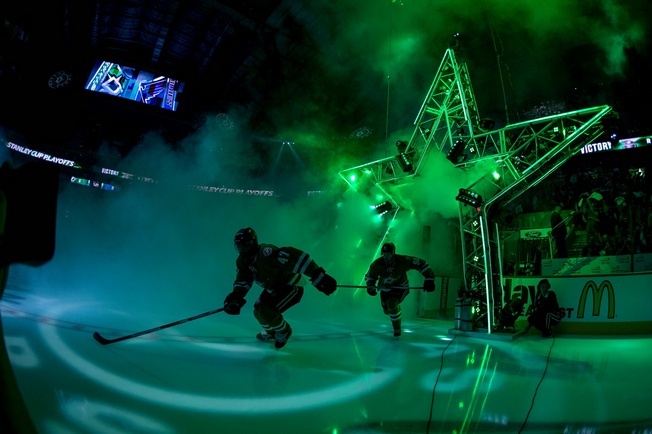 The Dallas Stars finished the 2015-2016 regular season with a 50-23-9 record, good for first place in the Central Division and first place in the Western Conference. They landed two points ahead of the St. Louis Blues. They scored a whopping 267 goals, tops in the National Hockey League, and allowed 230 goals against for a differential of +37. Jamie Benn led the way with 89 points, including 41 goals. Dallas boasted a dozen players to reach double-digits in goals, with 15 players having at least 20 points. The Stars used a wide open attack to generate offence and seemed to win games in the balance, with goalies Antti Niemi and Kari Lehtonen splitting the business in the crease and putting up average-to-good numbers. Dallas will hope to take the next step in 2016-2017 and have made minor adjustments along the way. Veteran defenceman Dan Hamhuis was brought in for stability and leadership on the blueline. Free agent Jiri Hudler signed a one-year deal worth $2 million just a few days ago, so his presence will bolster the forward group. Benn is clearly the leader of the Stars in terms of offence and the club proved this fact by signing him to an eight-year extension back in July. The 27-year-old from Victoria had surgery in July as well and recently announced plans to miss the World Cup of Hockey with designs on being ready for the NHL season. That type of dedication indicates that Benn is ready to put in serious work for his massive contract. Tyler Seguin worked a point-per-game pace last season, with 73 points in 72 games. Seven of his 33 goals came on the power play and he averaged nearly 19 and a half minutes of ice time a game. The 24-year-old from Brampton is a great skater, but injuries cut his playoff run short. He expects to be ready for the World Cup of Hockey. Jason Spezza continues to enjoy a renaissance in Dallas. He was third on the team in scoring last season, with 63 points in 75 games. And he was a beast in the post-season, putting up 13 points in 13 games and chipping in for an average of over 17 and a half minutes of ice time per contest. Patrick Sharp managed 55 points in 76 games, including seven goals on the man-advantage. He is a tremendous skater and has plenty of flexibility, which allows the Stars to mix things up on the top two lines. And with other forwards like Hudler and Ales Hemsky in the mix, Dallas will once again look to a variety of combinations to get things done. John Klingberg finished the 2015-2016 campaign with 58 points in 76 games. He found twine for 10 goals, four of which were game-winners, and he propels the attack in all game situations. The 24-year-old was drafted by the Stars in 2010 and is emerging as one of the finest offensive defencemen in the game. In the post-season, he nearly reached an average of 25 minutes of ice time a game. The Stars may have traded Alex Goligoski away to Arizona for a draft pick and they may have only touched base with Kris Russell, but there’s still plenty to like about the blueline. Johnny Oduya put up 21 points last season and averaged over 20 minutes of ice time a game, plus he’s handy enough to be used in a host of game situations. And Hamhuis brings a seasoned game. He had 13 points in 58 games last season and was steadfast in Vancouver. He has a commanding left-handed shot, which should slip him into Goligoski’s old spot alongside Klingberg. He’ll also have a lot to prove, as injuries limited him to just 117 games over the last two seasons with the Canucks. In goal, it’s more of the same. The Stars bet on Niemi and Lehtonen to split time and they did. Niemi had 43 starts and Lehtonen had 39. Each goalie managed 25 wins. Niemi had three shutouts, while Lehtonen had two. Niemi’s save percentage was 2.67 and Lehtonen’s was 2.76. Niemi faced a few more shots and had a few more losses. The Stars are banking on scoring more goals than the opposition and that’s a pretty safe bet given the extent to which they can propel the attack. But they’ve got a few prospects to lean on, just in case. Philippe Desrosiers is in the tank. He put in 10 games with the Texas Stars and 31 with the Idaho Steelheads and put up average numbers. He’s cool under pressure and that counts for a lot, so Dallas may be taking a closer look at him soon. Along with a few decent but limited goalies, the Stars have a solid prospect pool. Things are especially impressive in terms of blueliners, where there’s a lot of sizable defencemen to look at. Among them is Julius Honka, who was drafted by Dallas in 2014 and brings a hard, accurate shot from the right side. He’s yet another offensive powerhouse and could be ready to see action in the NHL soon. Stephen Johns, who arrived via trade in 2015, may be ready for a jump as well. He saw partial action in 10 playoff games and didn’t produce much, but the Stars like his size (6’4, 225 pounds) and know he can bring shutdown balance. His presence helps on a team that likes to push the puck up ice with aplomb, as Johns can crash and bang with the best of them. Fans of fast-paced hockey will have all they can handle with the Stars in 2016-2017, as this squad will run-and-gun right out of the box. They’ll undoubtedly lead in goals-for again, with Benn, Seguin, Sharp, and Spezza filling the net. The question is whether they’ll be able to push themselves more in the post-season, where goaltending really does win championships.